Why Are Smokers at Increased Risk for Developing Tuberculosis? Tobacco smoking, and exposure to smoke, increases the risk for developing tuberculosis, an infectious disease that kills a large number of people every year. Indeed, according to the World Health Organization (WHO), in 2014, tuberculosis—or TB for short—killed 1.5 million people worldwide (1.1 million HIV-negative and 0.4 million HIV-positive). The toll comprised 890,000 men, 480,000 women, and 140,000 children. TB now ranks alongside HIV as a leading cause of death worldwide—HIV’s death toll in 2014 was estimated at 1.2 million, which included the 0.4 million TB deaths among HIV-positive people. In other words, as discussed by Joanne Carter in the Opinion Pages of the New York Times, we have allowed a preventable, curable disease to become the world’s biggest communicable killer. Now, results from a recently published study (Lysosomal Disorders Drive Susceptibility to Tuberculosis by Compromising Macrophage Migration) explain why smokers, and people exposed to smoke, are at increasing risk of developing tuberculosis: smoking causes a type of immune cells—the macrophages—to become clogged up. What happens when the macrophages become clogged up? They move slowly, and lose their ability to fight M. tuberculosis. When M. tuberculosis enters the lungs, the first line of defense it encounters is the macrophage—the “big eater“. Macrophages migrate to the site of infection, engulf M. tuberculosis, and try to break it down. In many cases, macrophages are successful and kill M. tuberculosis, preventing TB infection. However, in some cases, M. tuberculosis manages not just to avoid destruction, but to use macrophages as “taxi cabs” and get deep into the host, spreading the infection and causing infected macrophages to form tightly organized clusters known as tubercles, or granulomas. Within the granulomas, the macrophages and bacteria fight a battle—if the macrophages lose, the bacteria spread from cell to cell. Indeed, the researchers found that ex-smokers have significantly fewer defective macrophages than smokers In addition, in ex-smokers, the ability of macrophages to migrate to M. tuberculosis was restored. In their paper, the researchers conclude that their findings provide an additional rationale for smoking cessation as a prescription for TB prevention. Although it is stated in the blog that in many cases macrophages are successful in killing M. tuberculosis there are cases where success is not the end result. In these cases M. tuberculosis is able to avoid destruction by macrophages. In one study conducted, macrophages that were infected with M. tuberculosis were examined over a period of time by using a vitro culture of human monocyte derived macrophages (MDMs) and inverted phase microscopy. After the MDM’s were infected with M. tuberculosis for at least 24 hours, researchers noticed that MDMs adhered to one another. The study revealed that adhesion of MDMs was associated with increased levels of LFA-1 and its counter receptor ICAM-1. Along with increased adhesion due to elevated levels LFA-1 and ICAM-1, there was a noted decreased in phagocytic capacity. The diminishing phagocytic capacity was contributed to the decrease in levels of phagocytic receptors CR3, CR4 and FcgammaRII. The results of this study can possibly provide another explanation as to why infected macrophages form tightly organized clusters as described in blog. Also the blog mentions how smoke particles can clog up macrophages thus preventing them to migrate efficiently and rendering them defective macrophages. Mycobacterium tuberculosis can have mechanisms that result in macrophages becoming defective macrophages. A M. tuberculosis that has infected a macrophage can alter phagasomal properties. One way it goes about doing this is by reducing lipolysis. The reduction of lipolysis can lead to host lipids being preserved within the infected macrophage. The retention of these lipids can provide an invaluable source of nutrients for Mycobacterium tuberculosis. Defective macrophages caused by smoking may not be the sole mechanism of pathogenesis for Mycobacterium tuberculosis. As Patrick mentioned, increased expression of LFA-1 and ICAM-1 in addition to phagocytosis evasion of the bacterium may also aid in lung tissue destruction. There are bacteria (that may result as a secondary infection to TB) that are able to exploit LFA-1 and ICAM-1 by using adhesins, or other attachment mechanisms. Tuberculosis paves the way for many opportunistic pathogens to also thrive. It is not uncommon for hospitalized patients suffering from tuberculosis to have secondary bacterial infections. Possibly secondary bacterial infections may include, Staphylococcus aureus (who typically reside in the nasal area), gram negative bacilli, pneumococci, Klebsiella pneumoniae and Pseudomonas aeruginosa. 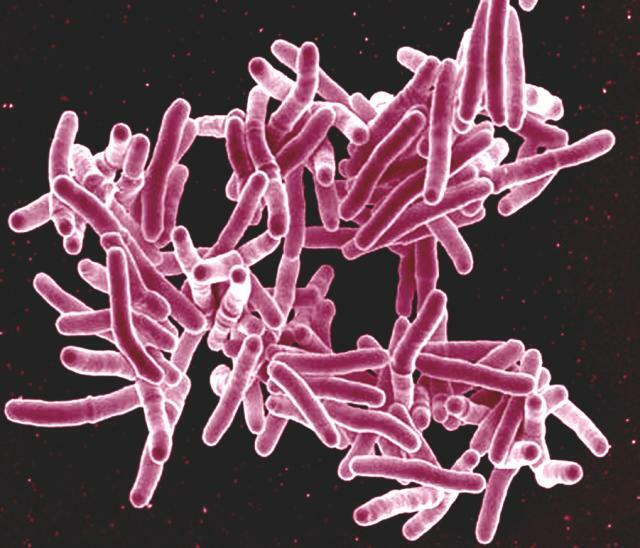 According to a study which analyzed secondary bacterial infection in tuberculosis patients, about 90 percent of those infected with M. tuberculosis are asymptomatic, as the bacterium lays dormant. Only 10 percent of those people will develop active tuberculosis. For those already infected with active M. tuberculosis, bacteria (opportunistic) have a higher chance of infecting lung tissue due to pathogenesis associated with M. tuberculosis. Secondary bacterial infections may arise, and with these infections come the virulence factors that exist for such bacteria. For example, S. aureus is capable of producing collagenase, leukocidin, and lipase. The virulence factors of S. aureus can work synergistically with the virulence factors of M. tuberculosis, as collagenase can impede leukocyte progression to the affected area (including macrophages) and leukocidin can create holes in white blood cells. S. aureus is also capable of producing protein A, which aids in phagocytosis evasion by binding to the Fc receptor of phagocytes. Not all strains of S. aureus carry the virulence factors listed above, and thus not all secondary bacterial infections will carry the same virulence factors; however, it is important to take into consideration other possible secondary infections that may aid M. tuberculosis’s pathogenesis. Special care must be taken especially for those afflicted with TB, especially if they smoke as smoking may lead a latent infection to become active, allowing the possibility of complications from secondary infections. This article touches on how tobacco smoking and smoke exposure can cause tuberculosis in patients. After reading this article I was curious to know if marijuana could cause TB as well. We live in a society where marijuana is a common recreational drug that is mostly smoked instead of eaten or injected. A lot of people have argued that marijuana doesn’t have any detrimental side effects, but I wonder if marijuana can cause tuberculosis. After completing the research I found that marijuana actually does spread tuberculosis. It is interesting because unlike tobacco which causes tuberculosis, marijuana does not cause tuberculosis. It is the practices in which people smoke marijuana that allow it to be spread so easily. Many people have found practices like hot-boxing, and sharing smoke fumes to be enjoyable. Hot-boxing is smoking marijuana in an enclosed car or room filled with smoke. 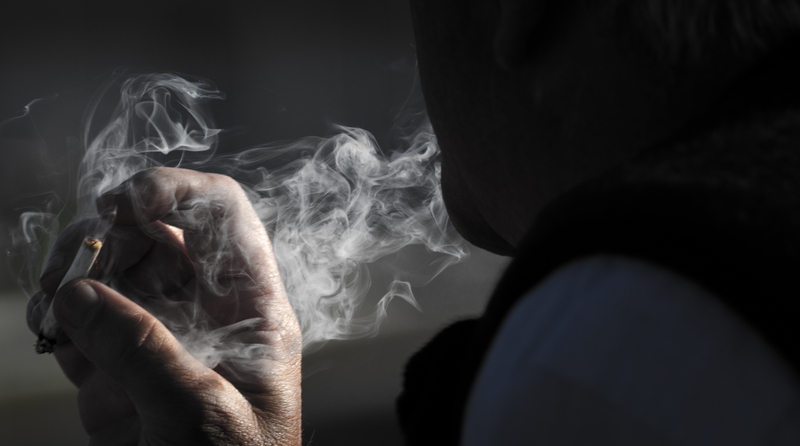 People share fumes by smoking marijuana and blowing the fumes into another person’s mouth. In both cases, tuberculosis is able to easily travel in these fumes, and if one person in the group is infected then everyone could potentially get infected. The chance of a marijuana smoker also being a cigarette or tobacco smoker is actually very likely. And because people have been unwillingly exposed, it has led to different tuberculosis outbreaks in marijuana smokers. Marijuana is an illegal substance that should not be consumed in the first place, however if it is assumed those actively participating in such act should be informed that they can attract tuberculosis from smoking marijuana with a group of friends. I agree with you that smoking, especially weed is the “cool” thing to do in today’s society. Not many people are conscious of the health effects it can cause also the high level of ignorance associated to their health when smoking. Tuberculosis is airborne, as you mentioned hot boxing or chain smoking increases the risk for participants involved to be infected with this bacteria. From a public health aspect, more needs to be done to make people aware of just how serious smoking can predispose you to TB. As I mentioned in my blog post below, once infected the recovery takes up to 6 months. If most people knew the severity of their habit, I believe the rate of smokers will decrease. I think you’ve opened up a great argument and I like your perspective on the topic. From your comment, I do see how smoking marijuana could facilitate the spread of tuberculosis due to certain practice marijuana smokers do. Something that also came to mind was that marijuana is often smoked out of tobacco wrappers, colloquially called “blunts.” There are also some users that mix tobacco with marijuana for a heightened effect. While reading this, I wondered what the effects are of smoking marijuana on the immune system. Of course, there will always be opposing perspectives on this topic. On one hand, one study found that smoking marijuana can suppress the immune system causing a huge surge in the amount of myeloid-derived suppressor cells. These cells suppress the immune system, and an abundance can lead to growth of cancer cells. We see in cancer patients much more of these cells than in non-cancer patients. Yet on the other hand, the same study tells that those with autoimmune disorders, immune suppression by marijuana may not be such a bad thing. Another study also showed that alveolar macrophages in marijuana smokers had limited antimicrobial activity due a chemical in marijuana that limited nitric oxide production in the macrophages. A limited synthesis of nitric oxide in macrophages has been shown to reduce its effectiveness against several pathogens, including bacteria. So this is a very interesting find. In general, it seems it is best to stay away from any smoke in which a drug or tobacco is the source. Smoking in general can cause major ailments to the body such as: cancer, slower metabolism, high blood pressure, etc. M. Tuberculosis can attack any part of the body like the kidney, spine and the brain; in most cases it is a fatal outcome if not treated swiftly. The article mentions that it is important to spread awareness that smoke and exposure to smoke makes you more susceptible to acquiring this fatal bacteria. Macrophages are one of the most important cells in the body because they clean up the debris the body leaves and when they are not functional its almost like having no immune response, similar to the effect of acute HIV infection. If a patient wants to over come this bacterial infection, it is a long road to recovery, being that it takes up to 6 months with four different medications. Overall, many people suffer the addiction of smoking tobacco and sadly macrophages resource will not be available unless they quit. Your post was quite interesting in reference to smoking and cancer. In addition to causing cancer, hypertension, and a slower metabolism, smoking also damages the columnar epithelial cells of the respiratory tract. These cells contain cilia and are responsible for secreting mucus, forming the mucociliary escalator. This escalator works by trapping pathogens in the muscus and carrying them up the respiratory tract, preventing their attachment and establishment. Therefore, damage to the cells can decrease the normal function of this mucosal membrane and lead to an inability of the respiratory tract to protect against infections. This may also contribute to the formation of TB in chronic smokers. Knox, I enjoyed your response especially how it touched on treatment. The fact that one of the main treatments is to quit smoking. I know it’s a lot harder than most people think because it is so addictive but the effects will change so fast. For example, after 24hours of not smoking, there is noticeable improvement in blood pressure and heart rate. An arrest in smoking has proven to slow down the progression of chronic obstructive pulmonary disease. In a lung health study, there are 5887 participants, all current smokers. Five years in, 149 smokers died from lung cancer. Statistics show that had they arrested smoking, the mortality would have been reduced by 32%, 45% with cardiovascular disease. In individuals with non-small cell cancer, mortality was reduced by 66% with an arrest in smoking. These were facts alone show that the leading treatment in anything smoking related is to quit smoking. While smoking tobacco can impair macrophage function, it seems as though it can also leave one susceptible to viral infections as well. There have been a couple of studies done that have shown a correlation between smoking and a reduced number of natural killer (NK) cells. Natural killer cells are the primary eliminators of virally-infected cells in the innate immune system, so it appears logical to conclude that someone who smokes will only speed along the development of a disease like HIV, and a consequential development of tuberculosis. However, unlike the restored performance of macrophages that occur after smoking cessation, as mentioned in the article, NK cell numbers never seem to fully recover, leaving one permanently more susceptible to viral infections. The article mentions one of our best killer cells, macrophages, being dysfunctional. The mechanism used by tuberculosis to inhibit macrophage function is brilliant. Not only do they stop their residential macrophage from phagocytizing, but also pulls other macrophages in to form granulomas. That’s hitting two birds with one stone. This can create a huge problem for the immune system, and it is why TB is moving on up in the world of infection. A study was done to counter this genius mechanism in other ways besides telling an addict to quit smoking, which is harder said than done. The study involved the drugs rapamycin alone, or in combination with isoniazid and rifabutin. Rapamycin is a drug used to control cell growth and increasing phagocytic activity. The other two are actual TB medication. It was found that rapamycin alone greatly reduced the number of bacteria in the lungs. Rapamycin particles encouraged autophagy, which is basically a cell shutting down on its own. But when the combination of drugs was used, it resulted in not only killing off infected macrophages with TB, but also restored tissue architecture of the lungs and airways. So this could quicken the process of replacing non-functional macrophages with brand new ones, which the body tries to do already according to the original post. Using a “cocktail” of drugs, such as the three listed above, is becoming a very common way for researchers to fight infections in the body. Using a multitude of drugs like this can fight back against drug-resistant strains, like TB has. This idea can be used as a temporary “catch-up” to the quickly spreading Tuberculosis disease. Macrophages are important phagocytic cells responsible for the elimination and presentation of pathogens. As stated in “Lysosomal Disorders Drive Susceptibility to Tuberculosis by Compromising Macrophage Migration” however, these cells can be evaded by a bacteria called Mycobacterium tuberculosis, leading to the formation of immune cell-bacteria complexes (granulomas) and server infections of the respiratory tissue. Furthermore, the study suggests that smoking may further promote infection through a mechanism in which the smoke particles “clog “macrophages and decrease their migration capacity. The results of this study are very frightening given the airborne infection capability of TB and the prevalent number of smokers around the world. In another study, “How tumour necrosis factor blockers interfere with tuberculosis immunity” it is stated that Tumor Necrosis Factor (TNF) is important in the development of inflammatory response and may be involved in the formation of granulomas in tuberculosis. The article goes on to state that TNF is important for the formation and maturation of the phagolysosome, a vesicle within macrophages that enables digestion of pathogens. TNF-blockers have traditionally be used to treat chronic inflammation and autoimmune disorders, however recent studies show that some TNF-blockers may increase the risk of reactivating granuloma formation in Tuberculosis. I think it would be interesting to consider researching the adverse effects seen by TNF-blockers on the treatment of granulomas. If researchers are able to pin point the exact mechanism of reactivation, it may lead to the formation of new drugs to treat reoccurring TB infections and even provide protection against the formation of granulomas. Without the protection of granulomas, the Mycobacterium tuberculosis bacteria should not be able to survive attacks by the immune system. Tuberculosis (TB) is an increasingly dangerous pathogen lurking within our society. After readying this article I was surprised to find of those who have succumbed to TB, the majority were not HIV positive. While it does make sense that as HIV treatments become more advanced and successful, their immunity wouldn’t be affected as much and they were be able to stave off infections. However, even with successful HIV treatment, these patients have a decreased ability to battle infections. I have been unable to find research specifically investigating why there is such a larger population of HIV negative patients becoming infected with TB. Perhaps there is an unknown mechanism of the immune system of HIV positive patients that somehow inhibits mycobacterium from causing such detrimental outcomes. While it is clear that there are a large, absurd number of HIV positive patients succumbing to the disease, the discrepancy between the two should be explored. It is possible that the answer lies in antiretroviral therapy. According the one website, a co-infected patient, with both HIV and TB, who takes ART has a higher chance of conquering the TB infection. This makes sense since mycobacterium behaves similar to HIV in that they both have a tendency to lay dormant and infect immune cells. It seems that while a significant amount of HIV patients become infected with TB, many of them are able to fend it off. This could be an interesting area of research, maybe ART would be entered into the treatment plan of those who contract TB whether they also have HIV or not. This would be an interesting avenue to persue! One piece of information is known for sure, smoking not only increases the risk of recurrent tuberculosis, it also increases risk of death due to the inability of the macrophages to engulf and destroy the TB bacterium. Therefore, smoking should be eliminated worldwide since it not only impacts other organ systems, but second hand smoke could be a culprit in affecting “innocent” (nonsmokers) who are unaware of the increased risks. This new spreading of TB should call for major actions such as these to prevent even further infection and destruction. I find your response to this post very interesting for multiple reasons. For one, I believe there are much greater risk factors at play contracting TB then just having HIV. Of course, we are all aware that HIV compromises the immune system, especially making those who are positive more vulnerable to respiratory infections. However, according to the Mayo Clinic, other risk factors are diabetes, certain cancers and kidney disease, and malnutrition. These are just a few, and also huge problems in various parts of the world. I also think the fact that TB spreads so easily from one person to another may also be a contributing factor to why a majority of those people were not HIV positive. The speculations you have made about ART being used as a treatment for TB for those who do not have HIV makes sense considering the research and data you have found yet. However, I don’t see how that would work. How can we treat a bacterium with an antiretroviral? TB and HIV replicate on two completely different mechanisms. I’m not sure if an ART would target TB in the same way it does HIV considering that TB is missing the enzyme that is targeted by an ART. That’s just my perspective on it. It seems like it would be similar to treating influenza with penicillin, for example. What penicillin is targeting, a bacterial cell wall, influenza does not have. I tried to research some cases in which an antiretroviral was used against a bacterium like TB, yet to no avail. Another thing…I too believe smoking should be eliminated worldwide. I’m not sure how much more research needs to be released for it to be banned. I think it’s money and politics why it still exists but since that is not in the scope of the class, I digress. It’s obvious why macrophages are the stars of the show when it comes to tuberculosis, they play an irreplaceable role in helping clear the bacteria from the lungs. Another possible contribution to the increased risk of recurrent TB seen in smokers is the almost complete suppression of cell-mediated T-cell responses caused from chronic exposure to nicotine. A study was done on mice to test the effect of long-term exposure of cigarette smoke on T-cell activity. The chronic exposure (greater than 3 months) of cigarette smoke caused low to no T-cell proliferation which led to an absence of B-cell proliferation and differentiation into plasma cells. In addition, no antibodies were produced in the face of infection. This study could provide an additional reason for the recurrent TB in people who smoked after treatment. It may be that some of those people were chronic smokers and their adaptive immunity was weak and therefore could not make sufficient antibodies to fight the returning infection. I agree that macrophages are the most important defense against m. tuberculosis and your post made me wonder about the role of the adaptive in the battle against this infection. The adaptive immune system can’t get activated without the innate system i.e. the dendritic cells. As we all know, dendritic cells play a massive role in activating Helper T cells. Most papers know these dendritic cells play a role in TB but are unsure what exactly. Also most of the research on these cells has been contradictory. Some papers argued that dendritic cells strengthened the immune response by presenting m. tuberculosis and activating the T-helpers leading to cytokines like IL-12 secretion. Others argued that m. tuberculosis inhibited DC antigen presenting thus reducing the hosts’ response. Another group argued that the effect of DCs on the bacterium depends on the type of receptors (strain) and cytokines at the time of interaction between them. According to Roberts and Robinson, infection of monocyte-derived dendritic cells with TB led to an increase of MHC-I, MHC-II and other receptors along with pro-inflammatory cytokines. Aside from macrophages during TB infection, other immune cells’ roles haven’t been fully understood. I think it would be beneficial to smokers and non-smokers alike to have as many options as possible when it comes to battling an infection as prominent and ubiquitous as Tuberculosis. Tuberculosis is one of the leading causes of death worldwide. It is an airborne disease that infects the lungs and other organs of the body. New studies show that smoking tobacco doubles the risk of tuberculosis infection. 5,567 Tuberculosis patients went through successful treatment. After treatment, 1.5% of the 5,567 people developed tuberculosis infection again. Why? Studies show that this 1.5% were regular smokers, smoking 10 or more cigarettes daily. Only .7% of the 5,567 people were non-smokers and were infected with tuberculosis for the second time. Studies show that smoking impairs macrophages, the first line of defense when M. tuberculosis enters the body. Macrophages in the body of regular smokers is clogged with smoke particles which cause them to respond slower to infection than in the body of non-smokers. If tuberculosis occupies the macrophage, they can form a tightly organized cluster which can move around and spread the infection faster within the cells. Now for non-smokers who have macrophages that can move fast enough, those macrophages can phagocytize the infected macrophages. However, for the clogged and decelerated macrophages found in the cells of smokers, these macrophages cannot efficiently phagocytize the infected macrophages. Studies even show that tuberculosis combined with smoking is more harmful than an HIV patient with tuberculosis. This emphasizes the severity of smoking given that people with HIV have a harder time fighting off infection because of an immunocompromised immune system. If smoking is stopped, the impaired macrophages can die off, and new macrophages can populate the cells and be more efficient at the killing of tuberculosis. It is shocking to see tuberculosis is still one of the most leading causes of death around the world today. It is even more shocking to see this in relation to tobacco smoking, especially after cigarette smoking has declined significantly in U.S. adults. Only 16.8% of adults were smoking in 2014. CDC has put out many campaigns that have helped to decreased the rate of smoking as well as taxes and regulations that been put on tobacco by the FDA. Even though the amount of adults that have quit smoking has decreased significantly, there is still a high percentage seen in teenagers today. The smoke being inhaled directly and indirectly can contribute to the harmful effects of the immune system and heightened effects of tuberculosis. Hopefully, with continued ads and campaigns, the decreased rate will be able seen in teenagers also and countries across the world. The article discusses how smokers have an increased risk for Tuberculosis. This is because macrophages get clogged up with smoke particles and can’t migrate or respond to infections efficiently. These are known as defective macrophages. Another disease from defective macrophages caused by smoking is chronic obstructive pulmonary disease (COPD). COPD is a progressive disease that gets worse overtime, it causes coughing that produces mucus, wheezing, shortness of breath, chest tightness, and more. (2) Alveolar macrophages located in the lungs normally perform phagocytosis on pathogens that enter. However, people with COPD are normally infected with bacteria Streptococcus pneumoniae and Haemophilus influenza because the macrophages are not working properly. (1) It is also believed tissue destruction and inflammation are a factor. This is cause by apoptosis of airway epithelial cells and lack of alveolar macrophages cleaning up the apoptotic material. (3) To avoid getting COPD, don’t smoke and try to avoid people that do smoke. It is also recommended to avoid other lung irritants. I was very interested to learn about macrophages link to chronic obstructive pulmonary disease (COPD) as well. According to the WHO’s estimation in 2004, COPD will become the third leading cause of death world wide by the year 2030. Currently 64 million people in the world suffer from this illness. So with a sever public health concern such as COPD, there have been many studies with potential therapeutic potential to prevent increasing case numbers in years to come. In the study done by the university of Melbourne, Macrophages and neutrophils are prominent cause of inflammation of the disease. They mentioned COPD doesn’t respond to anti-inflammatory drugs so they looked into the potential targeting of granule macrophages colony stimulating factors for treatment of COPD and found success in an animal based model. This can be further studied and can be used in humans after clinical trails.